Since the UCLA Community School opened in 2009, hundreds of UCLA students, staff and faculty from more than 26 units across campus have engaged and meaningfully interacted with the school. As partners, UCLA has helped create an ecology of best practices and innovative K-12 approaches in teaching and learning–all focused on creating pipelines to college and career success in this emerging digital and global era. In partnership with leading philanthropists, the school is becoming a model of next generation schooling and a resource for educators and policymakers in California and nationally. Public school funding in California ranks among the lowest in the nation. While affluent communities routinely provide access to enriching educational opportunities, schools in urban high-poverty communities are too often left without access to high-quality extended learning options such as arts programs, field trips, internships, and summer programs. The UCLA partnership provides these and other enrichment programs for students. Since 2009, Design for Sharing has teamed with UCLA Community School to provide long-term sequential arts programming for hundreds of fourth, fifth and sixth grade students. The UCLA Community School is the first in a series of Teaching Schools established by UCLA. These K-12 partner schools serve much the same role as the teaching hospital system that transformed our nation’s medical practices. Recognized in March 2015 by the State of California as a model of innovation in higher education, UCLA’s Teaching Schools are designed to create, evaluate, and demonstrate innovative instructional strategies; to help shape stronger teacher education programs; to serve as sites for training future and current educational professionals. Part of a national movement to create urban teacher residencies, Center X’s IMPACT Program started at the UCLA Community School in 2010. Learn more about how novices work alongside caring mentors in this story and this six-part public television series. When our school opened in 2009, UCLA Chancellor Gene Block noted the school’s impact would extend far beyond a single neighborhood. As a vibrant site for research-practice partnerships, the school maintains an active program of systematic inquiry that informs practice, ensures accountability, and creates generalizable knowledge about schooling. Read the latest Annual Report here. If you are interested in conducting research at the school, contact Research Director Karen Hunter Quartz at quartz@ucla.edu. 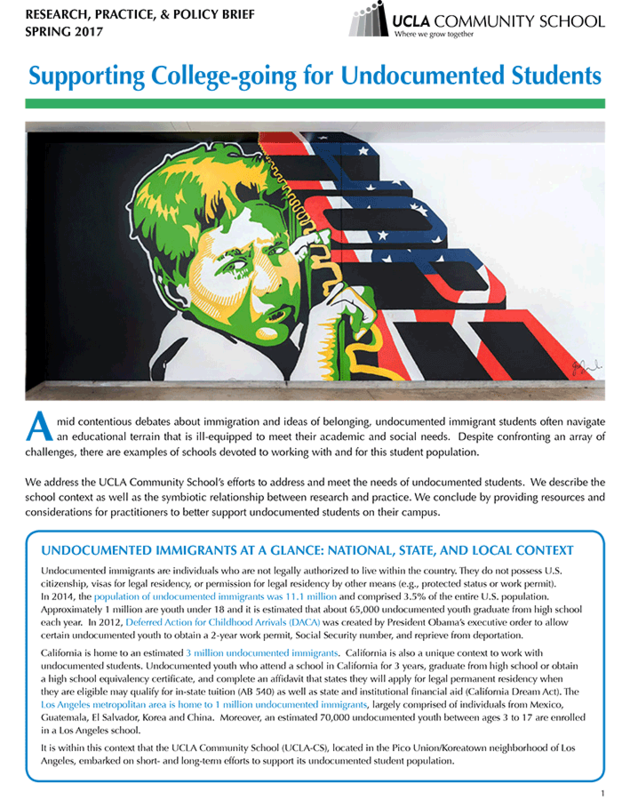 UCLA Community School is committed to advancing public scholarship on a broad range of issues facing educators, including the contentious debates about immigration. This Research, Practice, Policy Brief brings together researchers and practitioners as co-authors to share research, practical experience, and policy resources to inform the work of educators on this timely and important topic.